In the 1920s, Epiphone’s founder Epi Stathopoulo worked hard to bring the Stathopoulo family business into the thriving musical world of Manhattan. Jazz was the defining music of the time and prior to the introduction of the Epiphone Masterbilt guitar series, the banjo was the main rhythm instrument of jazz bands. 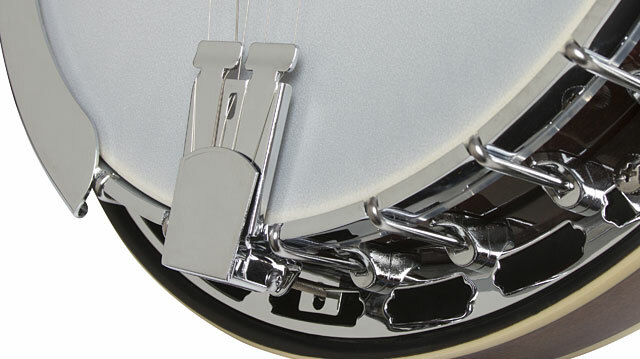 Thanks to Epi Stathopoulo’s many banjo patents and his keen sense of design, Epiphone’s new line of modern banjos quickly became the industry standard, respected for their full tonal range, great intonation, craftsmanship, and ornate designs. 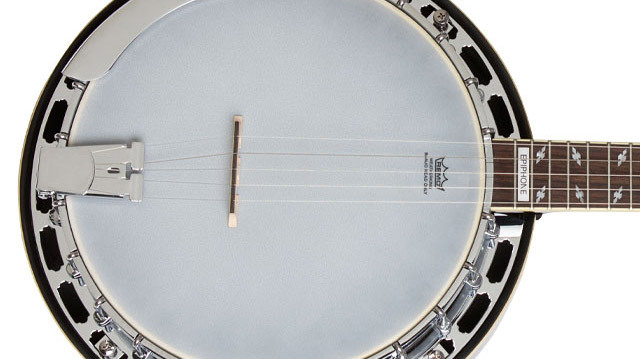 The new Mayfair™ 5-String Banjo has the familiar 5-string profile but with the classic Epiphone detail that made the “House of Stathopoulo” the premier banjo maker of its day. 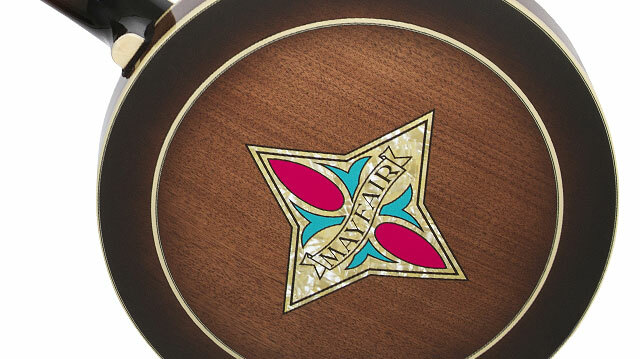 The Mayfair features a Mahogany Resonator with the historic Mayfair banner design in pearloid, blue, red and surrounded by period-correct pearloid binding. On the front is a nickel armrest and an industry standard Remo® head which provides maximum volume and tone along with a hard Maple bridge with an Ebony cap, and a traditional “clamshell” design tailpiece. The Mahogany neck has single layer binding and a traditional “C” shape with dual coordinator rods for full and even intonation everywhere on the neck. 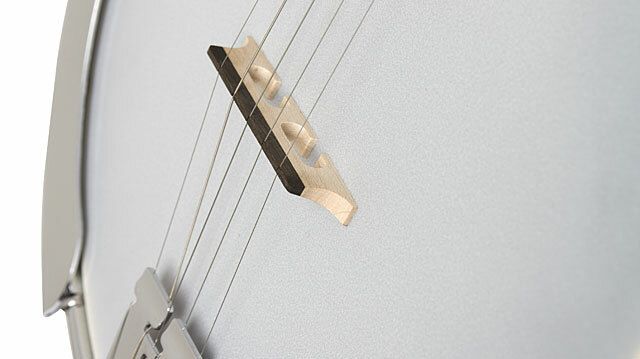 The fingerboard has 22 frets and traditional Epiphone “Snowflake” fingerboard inlay with the historic “Epiphone” logo at the end of the fingerboard. 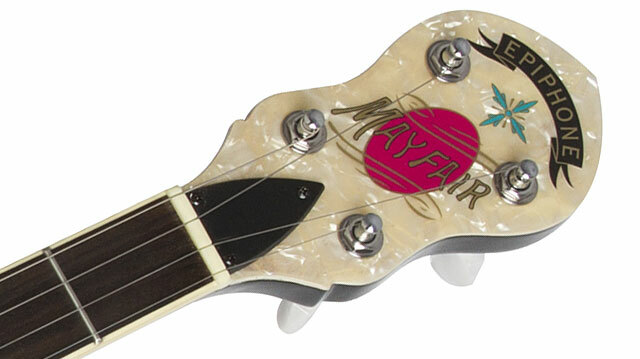 The headstock has traditional Epiphone banjo tuners as well as an 1920s style headstock profile with a perfect recreation of the era’s Mayfair logo in pearloid, red, and green and the iconic Epiphone banner logo in black and gold. An optional hard case is available. Like all Epiphones, the Mayfair™ 5-String Banjo comes with a limited lifetime warranty and world famous Gibson 24/7/365 Customer Service. Make some history of your own and try the new Mayfair™ 5-String Banjo today at your nearest Authorized Epiphone Dealer and visit Epiphone.com to discover more about Epiphone’s expanded line of acoustic and bluegrass instruments including the Masterbilt Collection.